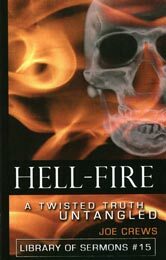 Hell-Fire: A Twisted Truth Untangled | Is Heaven For Real? the wickedness out of sinners? to win and a hell to shun. Jesus taught that every soul will be either saved or lost. There is no neutral place, and there are no second prizes. "The Son of man shall send forth his angels, and they shall gather out of his kingdom all things that offend, And them which do iniquity; and shall cast them into a furnace of fire: there shall be wailing and gnashing of teeth. Then shall the righteous shine forth as the sun in the kingdom of their Father." Matthew 13:41-43.
as soon as they die. spelled it out repeatedly in the gospels-those who are cast into the fire of hell will go there with hands, feet, eyes, and all the physical features of the body. They will not go in some ethereal state of formless spirit or soul. shall hear his voice, and shall come forth; they that have done good, unto the resurrection of life; and they that have done evil, unto the resurrection of damnation." John 5:28, 29.
life, and some to shame and everlasting contempt." Daniel 12:2. Can there be any doubt where the wicked are reserved before facing resurrection, judgment, and punishment? We have the testimony of Peter, Daniel, Job and the Master Himself. There is no room to quibble. They are reserved in the grave. until after the resurrection takes place. These people die the second death in the fire, but they cannot suffer a second death until they get a second life. They lived the first life in this world and died the first death, going into the grave. Before they can die a second death they must be resurrected-they must be given a second life. This, of course, is what happens at the end of the world. Jesus said, "All that are in the graves shall come forth." from which there will be no resurrection. But the point to be noted is the time of this hell-fire punishment-it is after the resurrection at the end of the world. It does not take place at the time of the first death as so many have been led to believe. shall be loosed out of his prison, And shall go out to deceive the nations which are in the four quarters of the earth, Gog and Magog, to gather them together to battle: the number of whom is as the sand of the sea. And they went up on the breadth of the earth, and compassed the camp of the saints about, and the beloved city: and fire came down from God out of heaven, and devoured them." Revelation 20:7-9.
abiding in him." 1 John 3:15. Will those murderers in hell-fire continue to have life for eternity? Never. does not mean a fire that will never go out. The same expression is used in Jude 7 concerning the destruction of Sodom and Gomorrha. "Even as Sodom and Gomorrha, and the cities about them in like manner, giving themselves over to fornication, and going after strange flesh, are set forth as an example, suffering the vengeance of eternal fire." was an actual place of burning just outside the walls of Jerusalem. No doubt, Christ's listeners could see the smoke curling up from the Valley of Gehenna, where dead bodies and garbage were constantly being burned. If anything fell outside the destructive flames, it was quickly consumed by maggots or worms. With the vivid scenes of utter extinction before their eyes, Jesus used the Gehenna fire as an example of the complete destruction of hell-fire. The fire was never quenched, and the worms were constantly at work upon the bodies-a picture of total destruction. of anguish and suffering. Both are wrong. The truth lies in between. God will punish the wicked according to their works, but He will not immortalize evil in the process. to tempt. It will be just exactly like God planned it in the beginning. was cast into the lake of fire. And I saw a new heaven and a new earth: for the first heaven and the first earth were passed away." Revelation 20:15; 21:1.